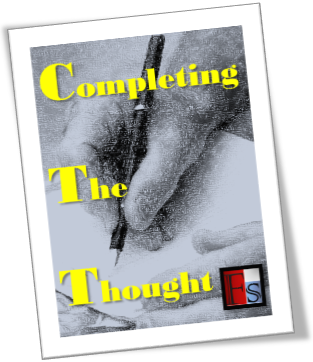 Today’s Completing The Thought (CTT) post is a bit of reflection on the traditions we hold in our local churches. Let us begin with the passage supporting Traditions in the Church followed by some discussion of traditions we see today. I think the greater context of this passage coming immediately after Paul reminds the church of Christ’s return and the man of lawlessness is important to understanding the implications of having a right understanding of keeping traditions. 13 But we ought always to give thanks to God for you, brothers beloved by the Lord, because God chose you as the firstfruits to be saved, through sanctification by the Spirit and belief in the truth. 14 To this he called you through our gospel, so that you may obtain the glory of our Lord Jesus Christ.15 So then, brothers, stand firm and hold to the traditions that you were taught by us, either by our spoken word or by our letter. Now, we do not have the spoken word of the Apostles, what we have is the written words of the Apostles (or spoken words that have been written and preserved by God the Holy Spirit). The pastoral epistles serve as our blueprint and guidance for church leadership, for offices within the church, and the call to preach Law and Gospel. We are taught how to pray, the importance of confession and repentance, forgiving our brothers in Christ, dealing with the unbelieving world. We are clearly instructed in baptism and the Lord’s Supper. Yet in all of these things and in many more, we run into some serious differences in the traditions observed by denominations and local church bodies. Not all traditions are good. How do we determine which traditions are good and which are not? The first step is to identify origins… and they should originate in God’s Word. There is some bad teaching out there that suggests that the Gospel can redeem pagan practices and make them fitting for Worship. God eliminated such rationale in Deuteronomy 12, which was recently the topic of a sermon by Dr. James White. There are also traditions that have a form of godliness, and come from a seemingly historically pious origins, but are merely the commandments of men. The Pharisees added to the Law their own explications, claiming it was a parallel oral Law given to Moses but meant only for the Priests to understand and to pass on, creating an elite class of enlightened God’s chosen ones. Jesus rebuked them strongly, plainly, and repeatedly for this error. But these traditions didn’t simply disappear after the Resurrection and Ascension of Christ. Paul had to address such commandments of men in his letter to the Colossians. 1 If then you have been raised with Christ, seek the things that are above, where Christ is, seated at the right hand of God. 2 Set your minds on things that are above, not on things that are on earth. 3 For you have died, and your life is hidden with Christ in God. 4 When Christ who is your life appears, then you also will appear with him in glory. 5 Put to death therefore what is earthly in you: sexual immorality, impurity, passion, evil desire, and covetousness, which is idolatry. 6 On account of these the wrath of God is coming. So, you see that when the occasion arises where the traditions of men start to undermine the Gospel of Jesus Christ, we have a problem. Even if these traditions come from the former things: questions of food and drink, festival, new moon, or Sabbath. Now, is observing these former statues a sin of itself? No, just like ritual washing of the hands before a meal isn’t a sin. Undermining the Gospel for the sake of these is the sin. What shall we say about traditions that are not commandments? In as much as the one observing the tradition is encouraged in the faith once delivered to the saints, as long as he/she is doing so for the Glory of God the Father, God the Son, and God the Holy Spirit, it is an act of worship done in faith and pleasing to God. As long as the traditions being observed are not objectively sinful or undermining the Gospel of Jesus Christ, then we have clear instruction from the Apostle Paul in his letter to the Romans. As for the one who is weak in faith, welcome him, but not to quarrel over opinions. One person believes he may eat anything, while the weak person eats only vegetables. Let not the one who eats despise the one who abstains, andlet not the one who abstains pass judgment on the one who eats, for God has welcomed him. Who are you to pass judgment on the servant of another? It is before his own master that he stands or falls. And he will be upheld, for the Lord is able to make him stand. I know it’s an academic no-no to bring in a new topic in a “conclusion” paragraph, but I’d like to challenge those of you who attend non-denominational churches to reevaluate your position on traditions. You have them, too. In some cases, inventing new traditions is itself a tradition… all too often these “new” traditions simple come from whatever can be found in the end-cap of your local “Christian bookstore”. We all have traditions. The traditions taught in the New Testament are essential for the Church to stand firm in the last days and guard against the man of lawlessness and the great apostasy. But whenever and wherever the topic of Church tradition arises… it must ever and always be submitted to the teaching of God-Breathed and all-sufficient Scriptures.